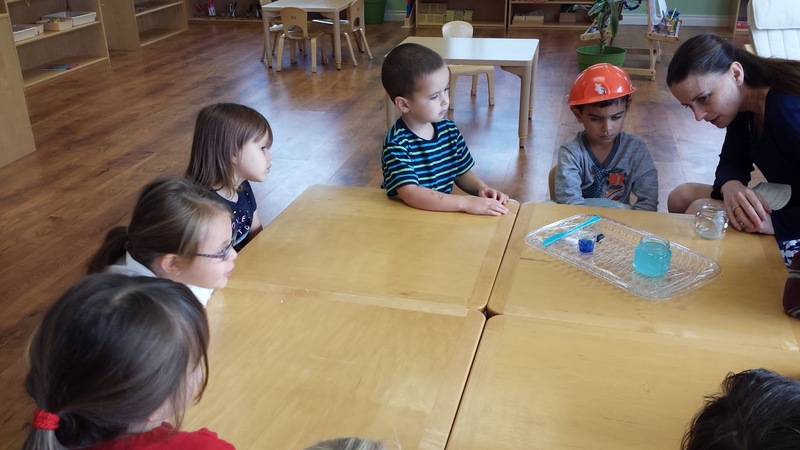 My friends bring their curiosity and wonder to school everyday. Why / how did that happen? The Gan is a garden where children bloom. and making "mistakes" (a hard moment to catch on film). Olivia made a rain stick /doubled ended light saber. While making it rain and saving the classroom from the dark side, one end fell off! Though she was pretty frustrated her beans fell out, Olivia picked them up and put them back in the tube. 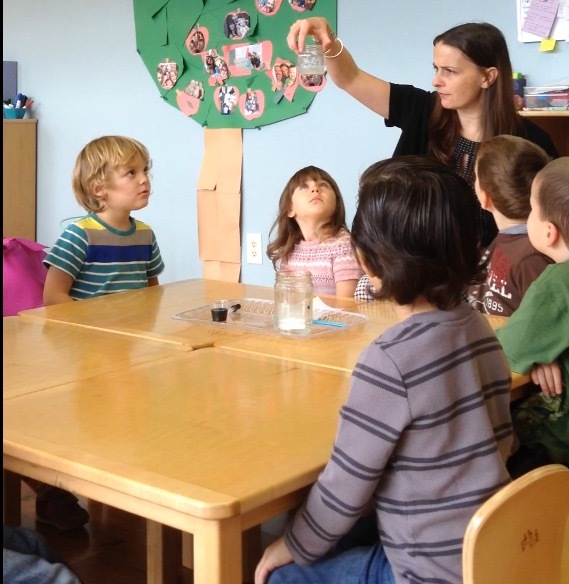 Once she had all the beans in her tube, she got more paper , more glue and sealed the end, again. This occurred perhaps a few times, but Olivia never gave up on fixing her rain stick/light saber. 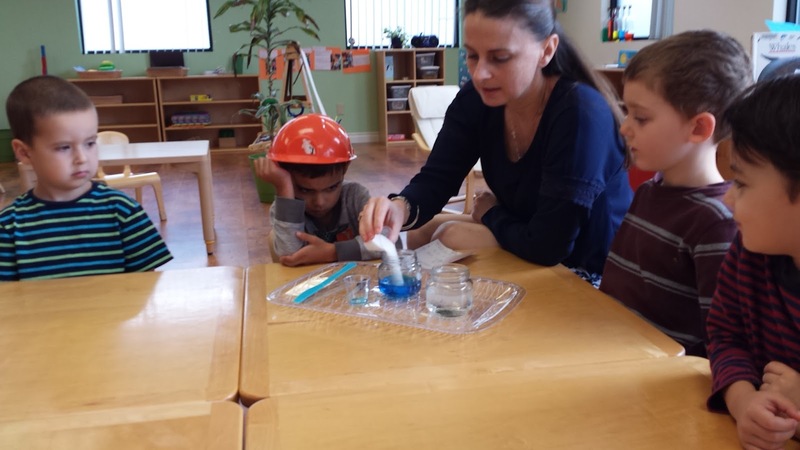 Attempting literal experiments in the classroom help develop a young child's creative thinking and persisitance. Hypothesis (guess): The salt water will sink to the bottom. Procedure: Fill two jars with water. 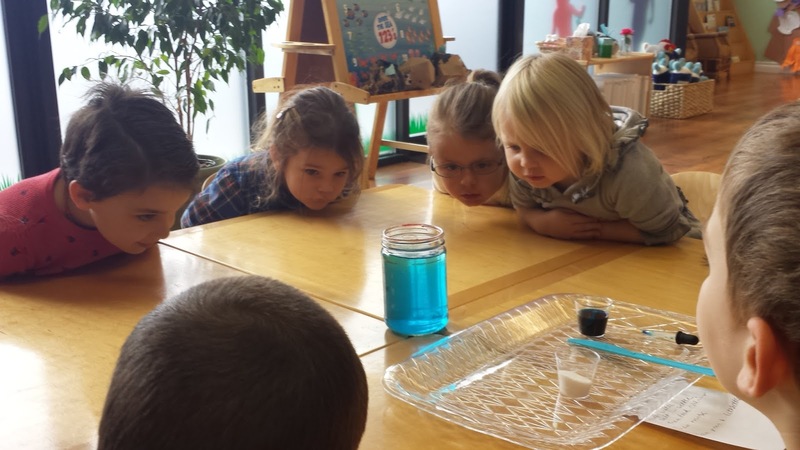 Add blue food coloring and salt to one jar; stir to combine. Add blue salt water to fresh water. Observation: The salt water mixed with fresh water. The salt did not sink. Conclusion: Our salt water was not dense enough to sink. Morah Katie: Experiments don't always turn out the way we expect them to, should we just give up? Clara: We should keep doing it and try it again. We tried one more time. 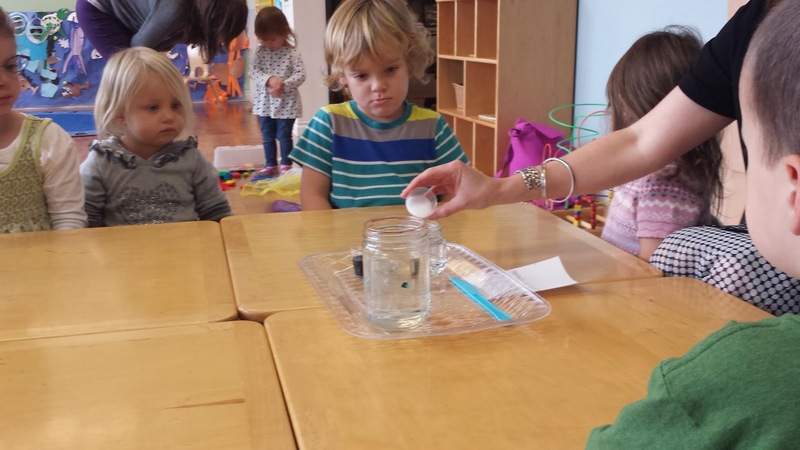 Morah Katie: Did the salt float? 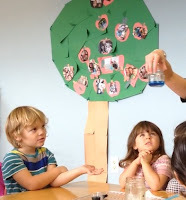 Judah: Yesterday we added the blue food coloring first. 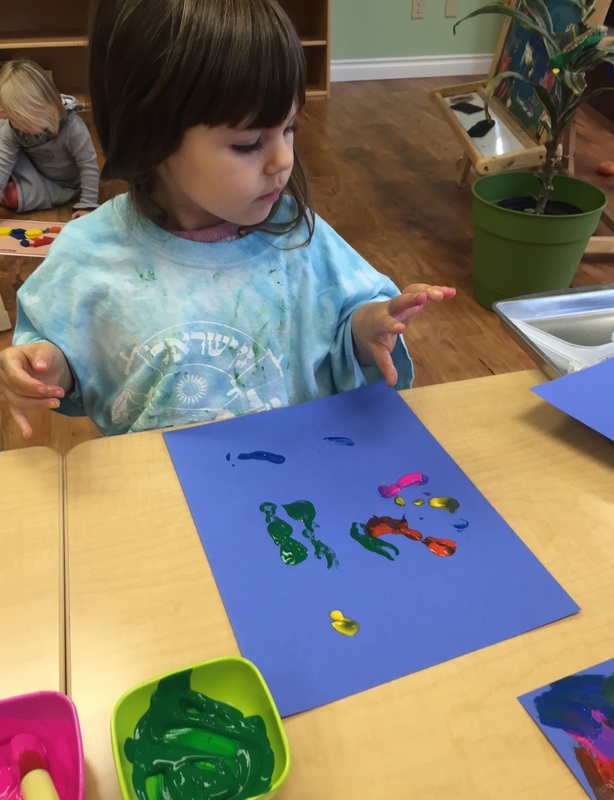 Morah Katie: You are right Judah. Today we are doing it differently because yesterday our experiment failed, but are we giving up? Morah Katie: We are trying it again. Morah Katie: Let's add our blue water and see what happens. What do you see? 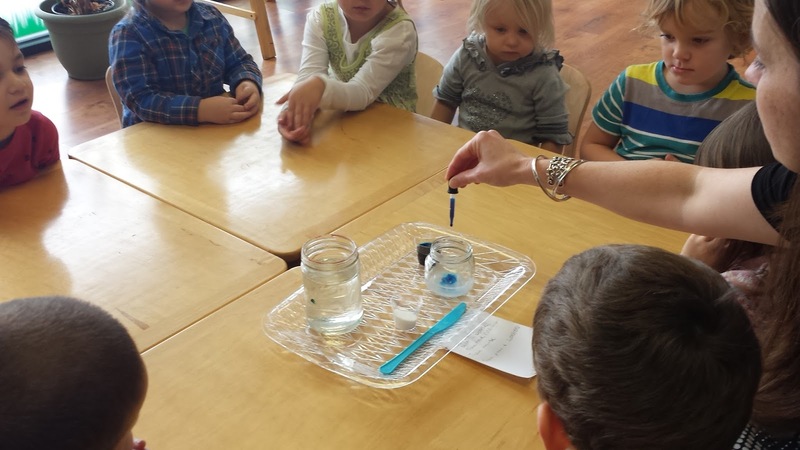 Is the blue water mixing with the salt? Evan: NO it's resting on top, it's floating. Augie: The blue water did not sink. Morah Katie: What does that tell us about the blue water? Is it lighter or heavier than the salt? 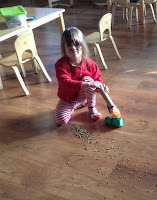 Morah Katie: We know this salt is heavy and sinks. What do you think our salty blue water will do? 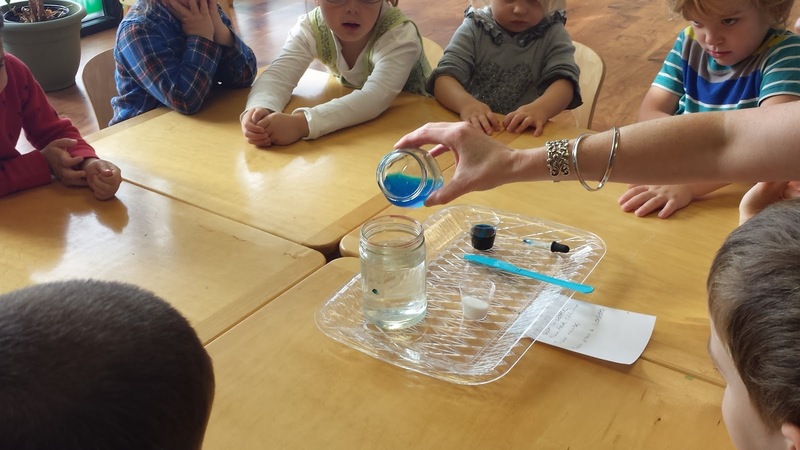 We added our salty blue water to the fresh water. The second part of our experiment failed again! Abe: We can just try again. We can apply this approach in other areas of the classroom. Children love to cut. It is not an instinctual ability like running; it takes effort and practice. 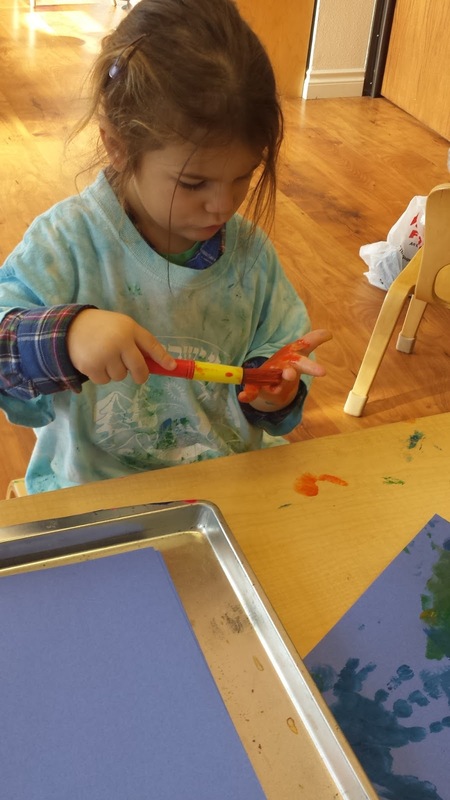 A young child learning to cut needs to exercise her fine motor skills to put her fingers through the handle. A child needs to spread his thumb from his fingers to open the blades, and then after stretching his hand he has to shut the blades, repeating this open/shut over and over and over. Children need to think about pointing the scissors away from their bellies, while keeping their thumbs facing the ceiling. It can be a challenge. When it gets hard, my friends can choose to give up, or take a break and try again. 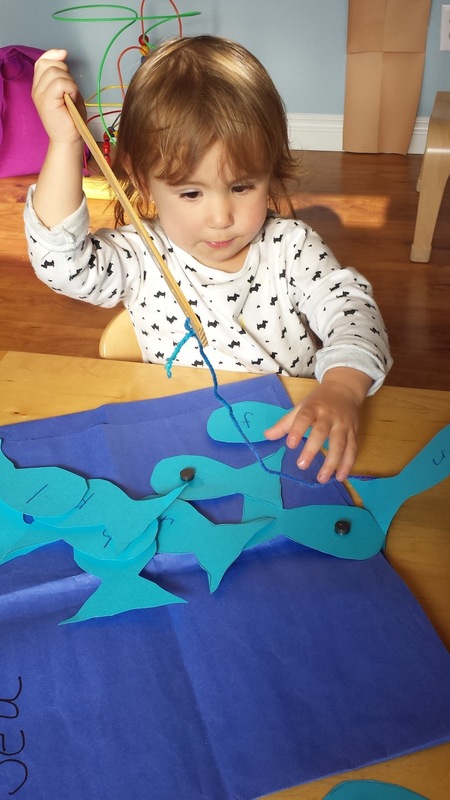 Last week Abe really enjoyed making the shark with Morah Breanna. 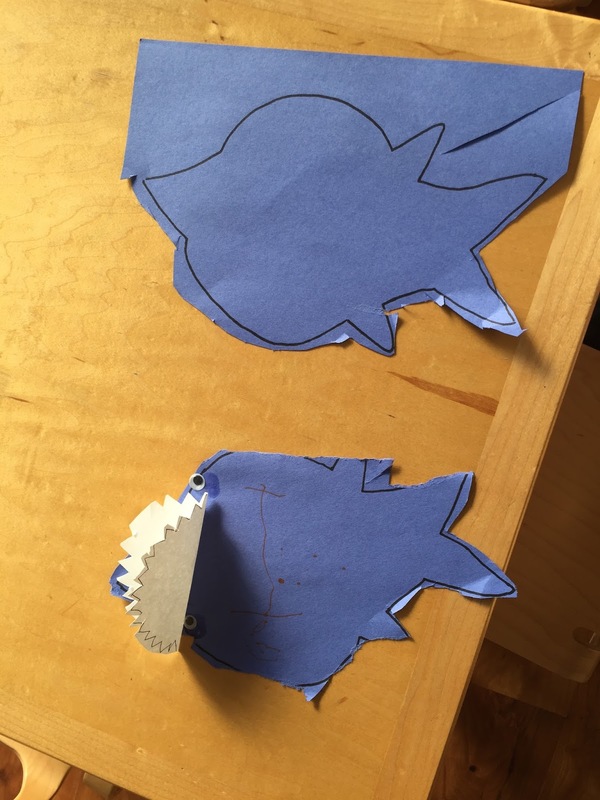 He chose to make a second shark the next day he was in class. Abe: The cutting is really hard. It is really hard to cut this. 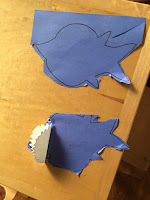 Morah Katie: Cutting can be hard, I have faith in you. Abe continued cutting for a few minutes and then decided it was too hard. He put the shark craft away. 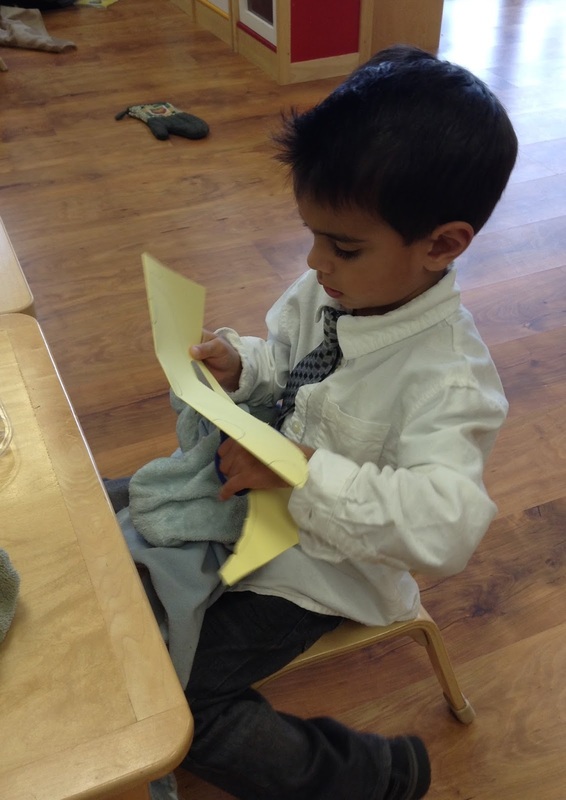 Abe came back to school Thursday and gave the shark craft another try. Abe: Look I am cutting it. I cut it all out. Morah Katie: You gave it another try and look at that! You did it. Asking a friend to play can be scary, we might hear "no". But if we never take the risk of hearing no, we may never hear a yes. It is not fun or easy to hear "NO". Matan had closed the door on his train. Sadie wanted on. Sadie grabbed a cone to step by. Matan yelled no, while Sadie responded with a push. 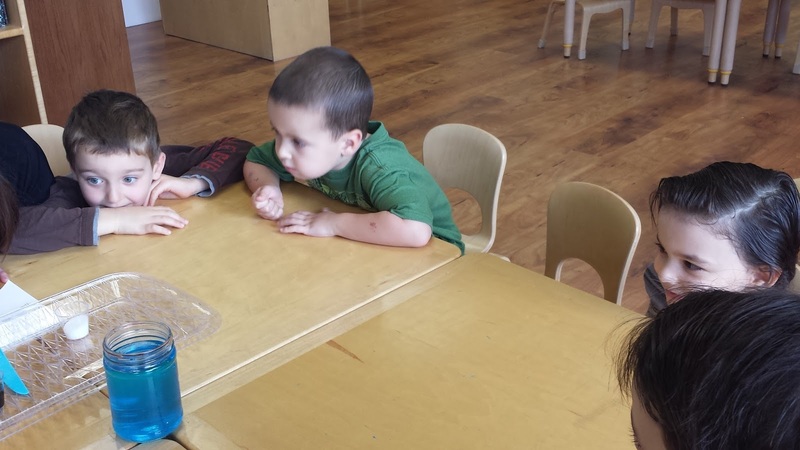 Morah Katie: Matan can you dip those words in honey and try speaking with Sadie again? Matan: Sadie I don't want you to walk in my train. Morah Katie: Sadie can you use sweet words with Matan? Matan: Ok Sadie you can come in my train. We will find our paths blocked and attempts thwarted. I believe a child is capable and can achieve any goal she sets. But if she lacks perseverance and does not make a second, or third (or multiple) attempts, she may never realize that goal. In our classroom failing is ok, as long as we look at what happened, explore why something failed, and try again. 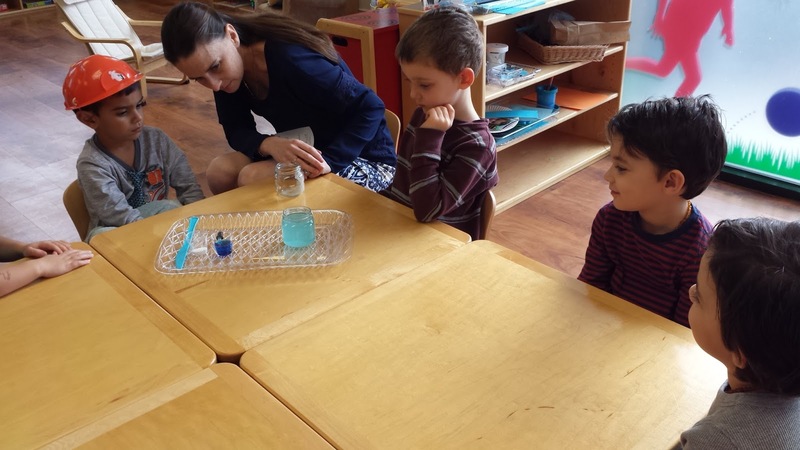 As the children take risks, experiment and make mistakes, they become more confident and skilled. They use those skills and confidence to take new risks, try new experiments and learn from new mistakes. Ari: Look I see little bits of salt falling out. Abe: And the water at the top isn't as blue anymore, it's clear again. Ari: The salt is finally sinking.